Hi, I’m Ben Souchek with Home Downsizing Solutions by the Sierra Group. 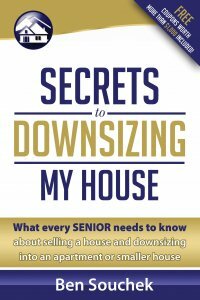 Are you currently thinking about selling your house or downsizing and not sure of the best solution that might be right for you. Or, maybe you’re just not aware of the different solutions that are available to you at this time? Most people, I’m sure, think about a traditional way of listing a house and selling a house with a real estate agent. There are some people that also know about home buying companies that buy directly from the seller, but do you know the positives and negatives of each or why a person would choose one over the other? I am a licensed agent, and my company also buys houses direct from individuals, which allows us to offer multiple solutions to home sellers and not just push a person one way or the other. And that’s good to be able to provide both of those solutions and not just one to home sellers. I think the main benefit of a traditional agent is the power of the multiple listing service, being able to put a house on the market for a lot of people to see. There are also services that a person can use that you don’t need an agent for these days but that is a primary reason, that I think anyway, to utilize an agent to list of property is just to have access to that large audience and professional representation. The negatives, of course, are having people come into your house that you don’t know, having to get a house show ready, and having to keep a house show ready or be expecting showings when you may not have an interest in people walking through your house. So, there are some downsides as well as dealing with buyers that may not be the easiest to get along with or make a lot of demands that you just don’t want to put up with or deal with. The positives with a home buying company, at least in our case, we make it extremely easy and stress and hassle free to sell a house. We buy a house as is. You don’t have to do any repairs or updates to the property. We can pay cash for the house. We are real buyers, not just wholesalers that get a house under contract and then try and sell that contract to somebody else. 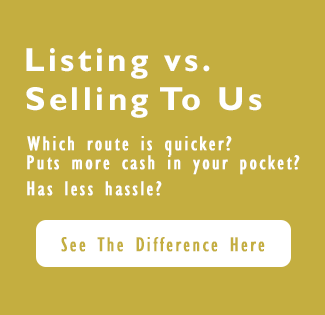 We pay all the closing costs, all the transaction fees so that we attempt to be as transparent as we possibly can so that you, as a seller, know exactly what you’re going to net from the sale of a house. And we allow you to leave whatever you don’t want to take or move in the house, and we’ll take care of it. So again, just trying to do things to make it very easy to sell a house, and we can be very flexible with closing dates and possession dates. So, if you’re not quite sure of the day that you’re going to be moving into your new home, your new residency, we can be very flexible with those dates and accommodate your schedule, which is not something typically that a traditional house sale will provide you. The downside is that obviously our company needs to make a profit when we do buy houses. I’m sure most everybody knows that, but that’s, I would say, I guess the main downside for using a home buying company is they may pay less than what you would net on a traditional sale. The thing that sellers have to decide is whether the benefits are a value or enough value to allow you to go that route. But either way, we can certainly assist you and offer the best solution for you and for your needs. For additional information, go to www.HomeDownsizingSolutions.com, www.HomeDownsizingSolutions.com, and I would be happy to assist in whatever way that I can. Thank you.